If you have photos or memories of this school you’d like to share, please contact us. MODERN ADDRESS Located on DeMontreville Rd. and 50th St., near Castle Railroad depot. 1879: District established. The first school (which eventually became Long Lake School) was built about 500 ft. from the next school built which was towards northern Oakdale. 1893: A new school is built for the third time. 1950s: School remodeled, and mostly torn down to build a residence. School was 9 months long. The school was named in honor of a Civil War veteran, Captain Henry A. Castle. The school had no library, and roads were hard to travel on. Enrollment in 1893: 25 students. 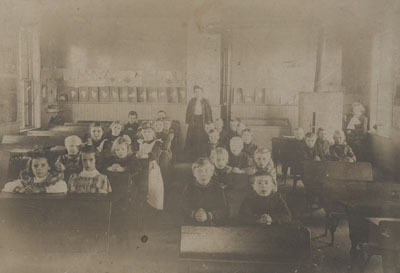 In 1899: 46 students. In 1938: 38 students. 1948-50: G. L. GonzalezOther teachers: Mary Neaton, Miss Vogler, Mrs. Holstrom, Margaret McIntyre, Amy Wilkinson, Mary Conlin, Kate Conlin.